Preheat the oven to 350 degrees. Spray a 9 x 13 inch baking dish with cooking spray. In a large pot of boiling salted water, cook the pasta according to the package directions for al dente and drain well. In a large skillet, heat the oil over medium-low heat. Add the onions and cook until soft, about 5 minutes. Stir in the garlic and cook for 30 seconds. Stir in the beef and cook until browned; season with salt and pepper. Stir in the tomato paste, then add the tomatoes and mustard. Let the mixture bubble gently until it is slightly thickened, about 2 minutes. 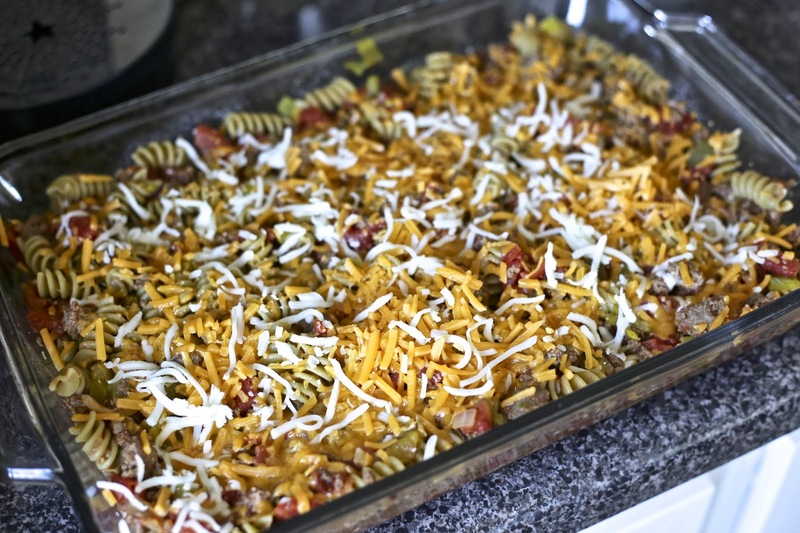 Toss the meat mixture with the pasta and spread it into the prepared dish. Top with the cheddar and bake until the cheese is melted, about 15 minutes. Sprinkle the chopped pickles over the top and serve. Makes about 9 cups.